Striving Bean – Helping you incorporate beans into your child’s diet. Why would anyone write a blog about eating beans? I started writing this blog because I’ve discovered over the years that beans are fantastic food – and a bit neglected in the American diet. And I’ve wondered – why aren’t families eating more beans? As part of my recent efforts to make strides toward living a more “green” lifestyle, I started making bean-centered dinners one time a week – known in my family as our “Bean Challenge“. I got creative in terms of variety – testing out which bean-centric meals my kids would eat – and discovering which ones they would outright reject! With experience and continued recipe testing and tweaking, I’ve learned creative ways to incorporate beans onto our family’s plates. 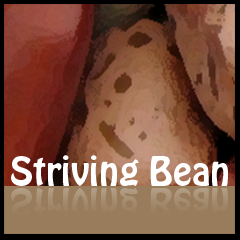 I hope you'll visit me at strivingbean.com! As for Striving Green - I'll pause this blog for a while. My sincere thanks for your support!